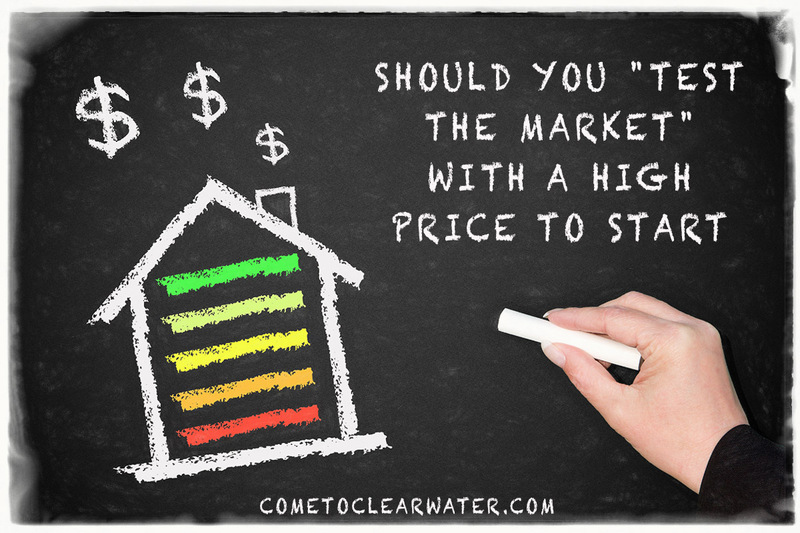 It sounds like a good strategy, “test the market” by asking a high price for your home. I mean, what harm could it do and you could even luck out and get asking right? Well, not so fast. It’s not a good strategy and here’s why. Who will and won’t see your home? For one thing, when you “test the market” the people who can actually afford your home at the right price won’t even see it. Most people start searches online but even if they start with a Realtor, the searches the Realtor does won’t include your home. Those that do see it won’t be interested. Your home will be too small or not what their price range usually offers. Of course, that means you won’t be getting any offers. Unfortunately, your neighbor who is also selling will. Your overpriced home makes their correctly priced one look good. Not to mention that the first few days your home will be on the market are the golden ones. Most deals are made then. People know what a home is generally worth. They do their homework. They also will be less likely to want to try and negotiate a deal. If they even see the listing. That means your home is sitting and a stale house doesn’t sell for asking, or even for less than the true market price. It’s true. When you lower a price because you asked too much to begin with, those who are interested will demand a bigger discount and more concessions. What if you do get an offer? So let’s say you actually get a bite at your first price. Guess what? The house won’t appraise at the high price and the buyer won’t get a mortgage. No mortgage, no sale. Oh, and if you find a Realtor who thinks it’s a good idea, find a different one! Sinkholes in Florida are not uncommon. Some areas are more susceptible to them than others, but as a general rule the entire state has the same kind of porous carbonate rocks that help create sinkholes. 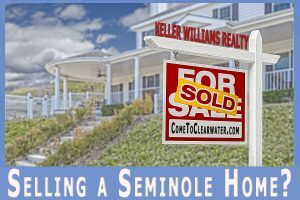 You want to buy a property in Pinellas County and wonder if you need to worry about sinkholes there. Sinkholes are caused by the wearing away of the limestone rock that makes up the substrata of Florida. Limestone dissolves away over time leaving holes. Usually those holes are filled with water which holds up the surface. Sometimes the rocks, soil or clay on the surface is too heavy and a sinkhole happens. Other times if the water is drained for one reason or another, the water is no longer there to hold up the surface and a sinkhole happens. There are generally three types of sinkholes: collapse sinkholes which are frequently triggered by fluctuations in underground water; subsidence sinkholes which generally form gradually; and clay shrinkage which vary seasonally and with annual precipitation changes. So is Pinellas a worry? To some extent, yes, anywhere in Florida has some risk of sinkholes. On the west coast in the Tampa area Pasco County and towns in Pinellas like Tarpon Springs and Palm Harbor have a lot more sinkhole activity than further South in Pinellas County. If you want to be sure, us a call or check with your insurance company. Both will have a good idea and when checking with your insurance company you can be sure if you will be able to get insurance for the property because of sinkhole activity. So go ahead, buy in Pinellas! 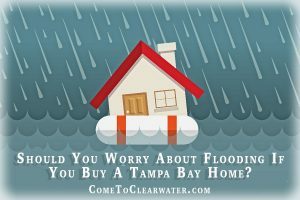 Should You Worry About Flooding If You Buy A Tampa Bay Home? 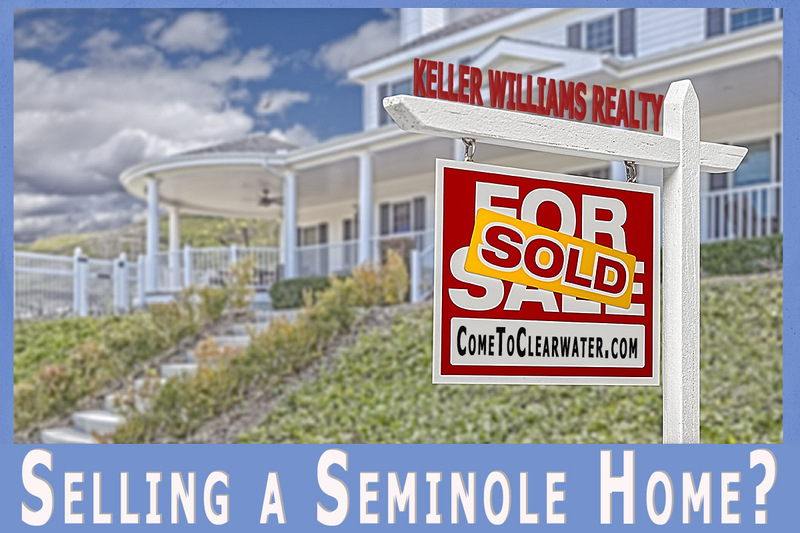 If you are looking for homes in the Tampa area you know that their proximity to water is close. Not only that but hurricanes can be an issue with causing floods. So, should flooding be a worry while you are house shopping? Let’s just say that you should keep it as a checkbox on the list of items to consider. For the most part it’s obvious that there are lots of coastal properties that need flood insurance. 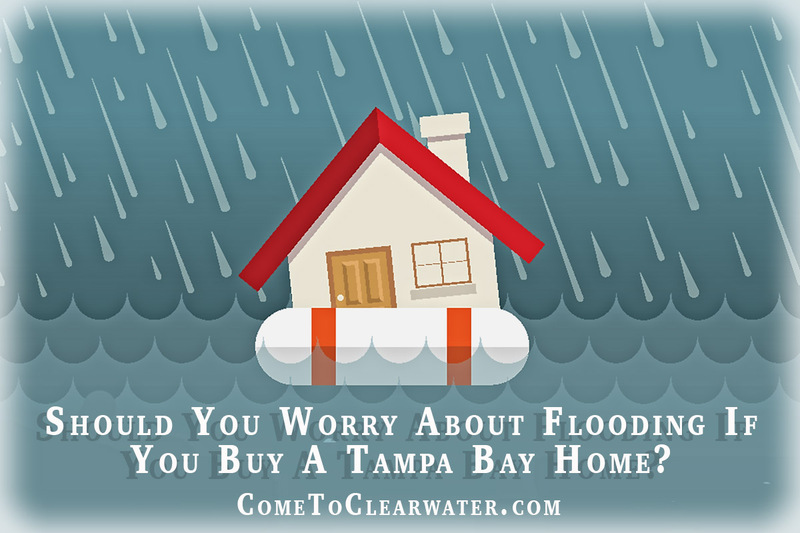 If you’re beachfront or a bay intercoastal front property then yes, you’ll most likely need flood insurance. There are also inland areas that have the potential for flooding problems in stormy weather due to tidal surges from the Gulf of Mexico or Tampa Bay. However, there are plenty of properties that are high enough that they don’t require flood insurance. Pinellas County doesn’t have that, but you can get an idea from the FEMA website, which has flood zone lists for every state. In Pasco County their county property appraiser has included flood zone/flood insurance requirement information with each property appraisal. The cool thing with this is that you can view a particular property and have the computer “paint” in any flood zones that might exist. Go to http://pascopa.com and click on record search, enter the street address for the property in question and get the tax id number for the property. At the top of the page you will see a link that says Show Map. Click that and use the drop-down menus to select additional layers and add the layers for FEMA Flood zones. Why worry when you can find out for sure? You are planning on house hunting and to prepare are watching all those HGTV shows and you have a long “must have” list for that perfect home. 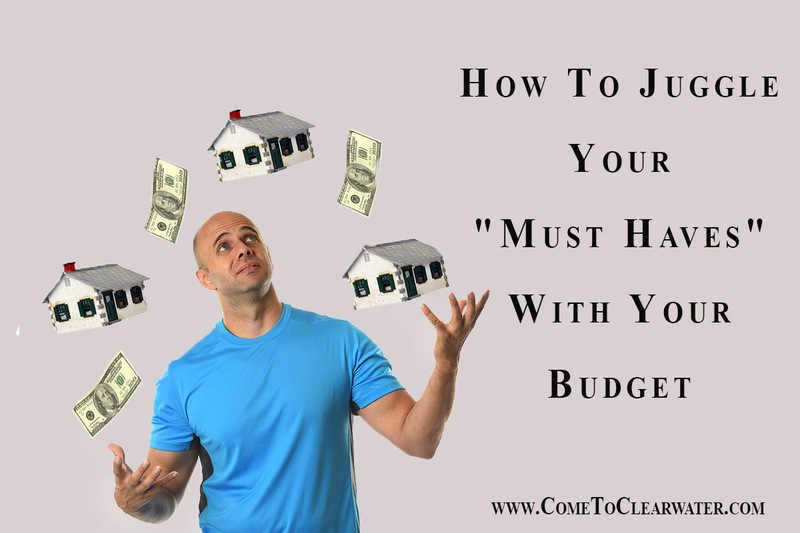 That’s great, but you also have a budget and all those “must haves” may not work with your budget. So what can you do? Do this by finding an experienced Realtor to help you look. He or she can help you start that search. Be honest with him or her about your budget, and all the things you want in a home, including all those “must haves. Your Realtor will let you know if your “must have” list is reasonable or not. More likely than not, it isn’t reasonable, so now what? For instance, a marble countertop is absolutely gorgeous, but is it something you can keep looking that way? If you are insisting that a pool and spa are absolutely necessary, do you realize that there is testing, chemicals and cleaning to be done on them on a regular basis? There is an extra cost to purchase chemicals. If this is something that you can’t do or afford, take it from your list. 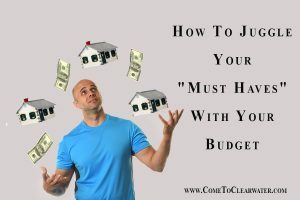 Generally, you need to be very honest with yourself about what is really a “must have” and what is an “I’d like.” Keep in mind that if your budget just won’t accommodate everything you want, you’ll spend a lot of time looking and never find what you want. 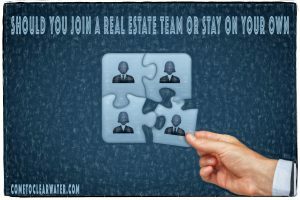 If you are a working Realtor or thinking about it, you’ve probably thought about what it would be like to work on your own. Owning your own business is, after all, the American Dream. But have you thought about the benefits of working with a team? Answering phones, typing out documents, showing properties, marketing them, etc. All of this on top of what you need to do to sell properties and make a living. It’s difficult and some people do it. You absolutely do get to keep all of your own income. Sure you can hire someone to do the administrative tasks, but then you have the sole responsibility of not just supporting yourself, but paying all of the taxes and benefits involved in employing someone. You also are completely responsible for paying the lease for your office space, utilities and other costs involved in being in business. So do the drawbacks outweigh the benefits? Probably not. The team shares the responsibilities. There is an administrative assistant to answer phones and type out documents, make arrangements for closings and other items. The taxes and responsibility of paying benefits and salary is shared by the team. The team benefits continue when it comes to finding leads, marketing properties, helping out if you’re new and being able to “sub in” if something comes up and you can’t keep an appointment. Yes, there are drawbacks. Commissions on sold properties are split between the Realtor and the team. After all there are costs involved in running a business and all need to pitch in to stay in business. That even applies if you came up with your own leads. Drawbacks, yes, but the benefits of that sharing are a huge help for any Realtor, especially a new one. So which will you do?